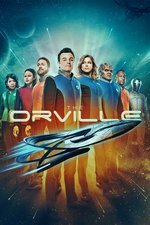 Ed has the opportunity to initiate peace talks with the Krill, while the Orville gets a few new visitors. Well, it appears an unexpected invasion of homicidal robots went and put the fear of Avis in everyone and accomplished what had previously seemed impossible. Wasting no time in the wake of the Kaylon attack, the Krill have reached out to the Union and began tenuous steps toward a peace treaty. We don’t have a specific timeframe for how long the two species have been at war, though at one point during the episode Ed alludes to the conflict going on for longer than he’s been alive. The Orville is tasked with initiating the process, despite being a mid-sized exploratory vessel with no focus on diplomacy. But as Admiral Returning Guest Star Ted Danson on a View Screen points out, even though both of Ed’s encounters with the Krill were by all measure disasters, the amount of time he spent with the race as a result places him in the dubious position of being the Union’s sole expert on the space zealots. But negotiations are nearly broken before they begin as the crew intercepts a Krill shuttle piloted by Orin (Mackenzie Astin), a prisoner of war, and an old friend of Gordon’s from Union Point. Orin and his daughter Trisha (Sarah Scott) escaped from a prison camp, but the Krill insist the pair managed to destroy three space cruisers in the process and demand their return. This seems impossible, since the tiny shuttle has nowhere near the capabilities of taking down a warship, but the Krill insist they be returned, lest talks are nullified. Despite the silliness, the TNG is strong in this episode. The music alone brought me straight back to 1990. This one was pretty good overall but the AV Club review pretty such said what I'd say. I did think some of the gags felt particularly shoehorned in and clumsy this time, the pee-in-a-cup stuff and some other things. Now that the show has found its weird vibe as a Trek show with a more casual crew, the occasional attempts to do Family Guy gags in space feel increasingly out of place. With the pee-cup gag it just seemed insane that Talla was humiliating the Krill delegation like that, even breaking out the rubber gloves to presumably give them some sort of probing. They were on the brink of a historic peace agreement, and they already knew these guys were prudish and prickly as hell! The gag wasn't that great and it flew in the face of all logic. I questioned why Gordon would show the not-daughter Planet of the Apes of all things. If she's supposed to be a mute, traumatized prison camp survivor, that seems like an awfully dark movie to show her! They've established that Gordon can be kind of an idiot man-child sometimes, but his heart is usually in the right place and this seemed clueless even for him. It also seemed REALLY weird just having Isaac back at his station after recent events. I know the show's committed to this, but it would seem like a lot of the crew would still be suspicious and resentful. I mean, why wouldn't they be? I haven't seen Mackenzie Astin in anything since... Christ, probably The Facts of Life. He was a real Tiger Beat kind of teen star back then, and it was weird to see him now not just all grown up but middle aged. He was good in this episode, though. I was right that the "daughter" was the weapon, but totally wrong about the means. I was going with "powerful psychic", which is why it didn't show up on any scans. Seems weird that none of the scans that were run repeatedly spotted that she wasn't human - you'd think after whatsername the "dark matter cartographer", that you'd at least be checking to make sure that people's outsides match their insides. Wait, I have a fix: the only person who would normally scan the daughter is the Good Doctor, and she never got consent for it (be a different matter if the daughter was seriously injured, but as far as they knew, it was entirely mental trauma). That being said, I still want to know why they don't check for spies. OTOH, one thing I liked was how long it took Orin to find what he needed to transport the Blood Bomb - it's been twenty years and Union ships have been upgraded since his last stint on something like the Orville. He knew it would be in engineering storage, just not sure where. Oh, I was wondering who that was. I kept thinking "Is this Bryan Cranston with one hell of a makeup job?" More than once, I've groaned at the obvious, trope-riddled setup for an episode, only to be completely won over by the way the show executes it. But I too was offended on behalf of the Krill by the schlocky stall tactics. They don't always nail the tone shifts very well. I loved that they opened with a scene where a blob of green slime is presented with an award for heroism, played with total sincerity. I found it amusing at how readily they acceded to going behind the crates and giving the sample. Science nitpick: something extremely reactive to nitrogen gas, but not oxygen? Not chemically, no. But (almost) anything is possible with enzymes (the proteins that do stuff). But no, not plausibly through purely chemical means as known. OTOH, N2 has a very strong triple bond that is resistant to chemical reactions, such as reducing it to ammonia compounds. Rhizomal enzymatic conversion by associated fungi of chemical nitrogen into bioavailable substrates are a huge thing in agriculture. If a catalyst or a biological enzyme could do it, N2 decomposition could potentially produce a lot of energy. I don't know the math to determine how plausible the scenario is. But the expected degeneration constant is so slow (of known N2 tropophores) that an explosion-type result is next to impossible. So... point for the writer s ? Ursula Hitler: I haven't seen Mackenzie Astin in anything since... Christ, probably The Facts of Life. He was a real Tiger Beat kind of teen star back then, and it was weird to see him now not just all grown up but middle aged. He was good in this episode, though. Monochrome: Oh, I was wondering who that was. I kept thinking "Is this Bryan Cranston with one hell of a makeup job?" He's a good at playing a nasty character in The Magicians (Wikipedia), if you want to see more of him (and it's a great show, IMO). One more agreement about the Krill delegation jumping through loops. For a moment during the episode, I thought perhaps Orin was actually a spy for the Krill, promised freedom for himself and his (then) daughter if he would grab some top secret stuff for them - what with the four Krill ship explosions being false. The reason for that being, "Patriotism is for people with large families..." line. I thought, AH HA, so he's sold out the Union so he can have freedom for him and his very small family of two. And....I was wrong. Ah well. Overall, I enjoyed the episode quite a bit, especially the directing with the final shot of Orin as the shuttle doors closed for the airlock.